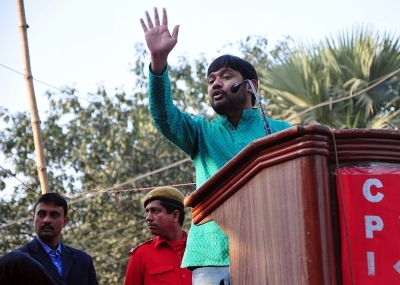 Rajkot, Feb 13 (IANS) Youth leaders Kanhaiya Kumar, Hardik Patel and Jignesh Mevani here on Wednesday accused Prime Minister Narendra Modi of tarnishing Gujarat's image,attacking constitutional institutions and targeting those who question him. Kumar, a former president of Jawaharlal Nehru University Students Union, said the Prime Minister had blemished Gujarat's image at the national level. On his visit, Kumar said, "For the past couple of months we are going to different parts of the country to carry out a programme called 'Samvidhan Bachao, Desh Bachao'. And our motto is 'Jai Jawan, Jai Kisan, Jai Samvidhan'". About contesting elections, Kumar said he was yet to decide on this. But Patel asserted that he would certainly contest elections, but was yet to make up his mind on the party or the constituency." Mevani, an Independent MLA from Vadgam constituency in north Gujarat, said he had no plans to contest the forthcoming Lok Sabha elections.